Most modern forms use carefully engineered solid materials to produce lasers in everything from supermarket scanners to DVD players to industrial robots. The new work, by Malte Gather and Seok Hyun Yun at the Wellman Center for Photomedicine at Massachusetts General Hospital in the US, marks the first time the phenomenon has been seen in a living system. The pair used green fluorescent protein (GFP) as the laser's "gain medium", where light amplification takes place. GFP is a well-studied molecule, first isolated from jellyfish, that has revolutionised biology by acting as a custom-made "torch" that can light up living systems on command. 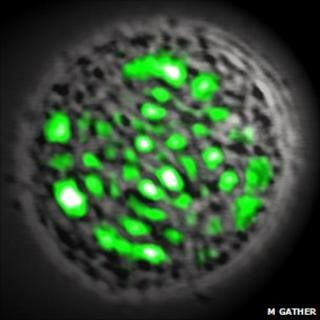 In the new work, cells derived from human kidney cells were genetically engineered to produce GFP. The cells were then placed one at a time between two tiny mirrors, just 20 millionths of a metre across, which acted as the "laser cavity" in which light could bounce many times through the cell. Upon bathing the cell with blue light, it could be seen to emit directed and intense green laser light. The cells remained alive throughout and after the process. The authors note in an accompanying interview in the journal that the living system is a "self-healing" laser; if the light-emitting proteins are destroyed in the process, the cell will simply produce more. "In cellular sensing, we may be able to detect intracellular processes with unprecedented sensitivity," they said. "For light-based therapeutics, diagnosis and imaging, people think about how to deliver emission from an external laser source deep into tissue. Now we can approach this problem in another way: by amplifying light in the tissue (itself)."